Can Deadpool Win Its Second Weekend at the Box Office? With a slew of superhero movies set to arrive later this year, 20th Century Fox's Deadpool has already set the bar incredibly high for box office expectations. 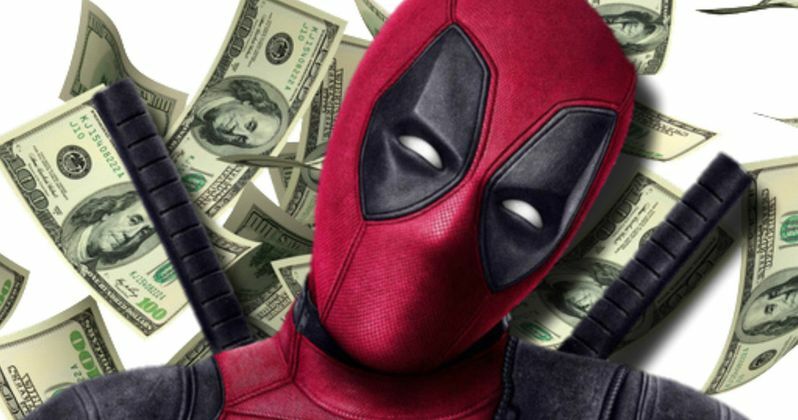 Despite, or perhaps because of, its R-rated nature, Deadpool destroyed several box office records, taking in $135 million in its opening weekend, the highest opening weekend for any R-rated movie and the best debut ever for a 20th Century Fox movie. Heading into its second frame, this unconventional superhero movie squares off against three new releases, Focus Features' biopic Race, Sony's drama Risen and A24's critically-acclaimed horror-thriller The Witch, none of which stand a chance of taking down the Merc With the Mouth. While the opening weekend numbers are obviously of critical importance to any movie's success, the second weekend often indicates how much longevity a film may have in theaters. With Deadpool still riding high on plenty of critical buzz (84% Fresh on Rotten Tomatoes) and positive word-of-mouth, we're estimating that the Merc With the Mouth will easily retain the top spot this weekend with roughly $70 million, which is more than enough to take down these three newcomers, according to the projections at Pro.BoxOffice.com. Risen is expected to open in second place with $11.5 million, followed by Kung Fu Panda 3 in third place with $11.1 million, Race in fourth place with $10 million and How to Be Single rounding out the top 5 with $9.8 million. After receiving a slew of positive reviews, with an 84% "Fresh" Rotten Tomatoes rating, Deadpool shattered the record for highest grossing R-rated opening weekend of $91.7 million, held for 13 years by The Matrix Reloaded. It also broke Fifty Shades of Grey's February record of $85.1 million, along with its four-day President's Day weekend record ($93 million), the record for highest-grossing R-rated comic book adaptation (300, $70.8 million), largest winter opening weekend (American Sniper, $89.2 million) and it became the biggest opening ever for 20th Century Fox, surpassing 2005's Star Wars: Episode III - Revenge of the Sith record of $108.4 million. It's also worth noting that, last month, early projections predicted the highly-anticipated Batman v Superman: Dawn of Justice will earn $154 million on its opening weekend, and that's with a PG-13 rating and two of the most beloved heroes on the planet featured in the same movie. Obviously, those numbers could, and most likely will, change, especially since Deadpool's early projections put it between $55 million and $60 million. Still, for Deadpool to earn so much with the restrictive R rating, opening higher than all of the other X-Men movies, could provide a wake-up call to studios that may lead to more R-rated superhero movies. The faith-based drama Risen tells the epic New Testament story of the first forty days after the Resurrection of Jesus Christ through the eyes of an agnostic Roman Centurion charged by Pontius Pilate to investigate rumors of a risen Jewish Messiah and locate the missing deceased body of Jesus of Nazareth in order to subdue an imminent uprising in Jerusalem. The film boasts an impressive cast including Tom Felton, Joseph Fiennes, Cliff Curtis and Stephen Greif. Kevin Reynolds writes and directs his first film in a decade, following 2006's Tristan & Isolde. Race is based on the incredible true story of Jesse Owens (Stephan James), the legendary athletic superstar whose quest to become the greatest track and field athlete in history thrusts him onto the world stage of the 1936 Olympics, where he faces off against Adolf Hitler's vision of Aryan supremacy. Race is an enthralling film about courage, determination, tolerance, and friendship, and an inspiring drama about one man's fight to become an Olympic legend. Jason Sudeikis, Jeremy Irons, Carice van Houten, Amanda Crew, William Hurt headline a stellar cast in this true story biopic, directed by Stephen Hopkins. Rounding out the top 10 this weekend will be newcomer The Witch ($7.5 million), Zoolander 2 ($6.8 million), The Revenant ($5.1 million), Hail, Caesar! ($3.9 million) and Star Wars: The Force Awakens ($3 million). While no Rotten Tomatoes scores are posted yet for Risen and Race, The Witch has an impressive 87% RT score, wowing critics on the festival circuit all last year after debuting at Sundance. The story is set in the early 1600s, decades before the Salem Witch Trials, centering on an English farmer who relocates his family to a plot of land on the edge of a forest, where a supernatural presence is said to lurk. Newcomer Anya Taylor-Joy stars as the farmer's teenager daughter Thomasin, who has been accused of being a witch in this shocking thriller from writer-director Robert Eggers. Also opening in limited release is Embrace of the Serpent, Neerja and Busco Novio Para Mi Mujer. Looking ahead to next weekend, three new movies will head to theaters, 20th Century Fox's true story adaptation Eddie the Eagle, Lionsgate's action-thriller Gods of Egypt and Open Road Films' crime thriller Triple 9. Also opening in limited release is Crouching Tiger, Hidden Dragon: Sword of Destiny, which will also debut simultaneously on Netflix, a re-issue of Akira Kurosawa's Ran and Tere Bin Laden - Dead Or Alive. Take a look at the projected top 10 for this weekend, and check back on Sunday for the box office estimates.